This is the first in a series of the original Paw Patrol dogs. This is Rocky. He is the designed to portray a park ranger. Rocky is a mongrel type of dog. 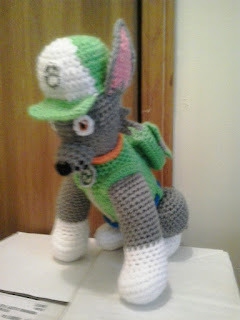 He, along with the other 5 Paw Patrol dogs, are a request from a co-worker. The others will be coming soon. Worsted weight yarn: Grey heather, spring green, pewter, perfect pink, orange, white, blue, black, and carrot. Rds 6-9: sc in each sc around. (36) Change to spring green after Rd 8. Rd 30: (sc in next 3 sc, sc2tog) 4 times, sc in next 4 sc. (20) Change to grey heather. Finish off leaving a long tail. Weave tail through sc of Rd 49, pull tightly and secure. Weave in ends. Using gray, surface chain stitch up center of front of BODY for zipper. Finish off leaving a long tail. Sew to BODY adding stuffing in MUZZLE before closing. Using black, embroider spots and mouth on MUZZLE. Finish off leaving a long tail. Sew to MUZZLE. Embroider EYES and EYEBROWS on PAW PATROL ROCKY. Rds 10-13: sc in each sc around. (18) Change to grey heather. Finish off leaving a long tail. Wrap BELT around bottom of edge of uniform and sew together. Finish off leaving a long tail. Sew BELT LOOPS to BODY. Weave in ends. Using graph above, floss, and Aida cloth to cross stitch MEDALLION. Rd 1: Attach gray floss and using Size 6 crochet hook in center of top of MEDALLION, sc in evenly around outside edge with 2 sc in each of Rws 16 and 14 and 2 sc in center of foundation ch, slip st in first sc, ch 10, wrap around COLLAR, slip st in first sc of EDGING. Finish off in first SMALL TAIL POINT. DO NOT FINISH OFF IN SECOND SMALL TAIL POINT. Rd 1: Holding INNER EAR and OUTER EARS together and working through both thicknesses, ch 1, sc in side of next 5 Rws, (sc, ch 1, slip st) in Rw, (slip st, ch 1, sc) in Rw, sc in next 5 Rws, 3 sc in free loops of foundation ch, sc in next 12 Rws. Rd 1: Holding INNER EAR and OUTER EAR together and working through both thicknesses, ch 1, sc in next 12 Rws, 3 sc in free loop of foundation ch, sc in next 5 Rws, (sc, ch 1, slip st) in Rw, (slip st, ch 1, sc) in next Rw, sc in next 5 Rws. Finish off leaving a long tail. Sew EARS to head of PAW PATROL ROCKY. Finish off leaving a long tail. Sew Rw 1 and Rw 32 together. Sew SIDES to BODY stuffing before closing second SIDE. Weave in ends. Finish off leaving a long tail. Sew PUP PACK POCKETS together and sew closed. Sew PUP PACK PCOKETS to PUP PACK. Sew PUP PACK to ROCKY. Finish off. Weave in ends. Sew HAT to head of PAW PATROL ROCKY stuffing before closing. Using graph above, floss, and Aida cloth to make PAW PATROL LOGO. Rd 1: Attach white crochet cotton and using Size 6 crochet hook in top of PAW PATROL LOGO, sc in evenly around outside edge with 2 sc in each of Rws 16 and 14 and 2 sc in center of foundation ch, slip st in first sc. Finish off leaving a long tail. Sew PAW PATROL LOGO to HAT. Finish off leaving a long tail. Sew SUDEBURNS to head of PAW PATROL ROCKY. Rocky and Paw Patrol are copyright Spin Master Entertainment and their respective creators.